Every business that deals directly with customers can derive excellent benefits from investing in a customer relationship management (CRM) system. CRM systems are designed to help in all aspects of a business’ dealings with its customers. They provide a streamlined approach to delivering relevant information as and when required. When CRM is properly implemented, all staff members work from the same set of integrated tools, using the same centralized database. This leads to increased productivity and better use of one of a business’ most important assets, namely its customer information. CRM provides an efficient way to store multiple streams of information about customers. Staff members with relevant access rights can quickly and simply access information like the customer’s past purchases, customer feedback, and personal information. Being able to personalize interaction with customers is one of the best ways to assure repeated business. All staff members who interact with customers should be encouraged to record all information they get. For example, a sales rep chatting to a customer learns that the customer celebrated her birthday yesterday. That sales rep should record the date, and create an event that will trigger an automatic birthday greeting in subsequent years. CRM helps a business develop by providing real-time analysis of trends. By being able to adapt quickly, the business can exploit growing trends, and can move additional resources to achieve higher sales in the growth area. Similarly, when a market segment shows signs of shrinking, the business can decide to move resources elsewhere, or tackle the decline by investing more resources in that area. Most businesses have to invest in products or raw materials before selling them on. By reducing the time lapse between the purchase and sales, the company benefits financially. CRM helps do this and helps eliminate problems like overstocking. By providing the opportunity for focused marketing, CRM saves money that would be spent on wasted efforts. There is no point in a rep calling or visiting a customer to offer a product that the customer does not want or has no need for, or cannot afford. Additionally, customers can react negatively when sales reps appear not to understand their needs. When a sales or marketing effort is concentrated on customers who are known to be interested in a product or service, the conversion rate will automatically increase. The data analysis functions provided by CRM systems make this type of targeting possible. CRM provides businesses with the ability to analyze customer buying trends. This data can show where additional sales can be achieved. When you buy a book on Amazon, that company’s CRM system will show you a list of books bought by other customers who also bought your book. This type of instant up-selling is very effective and very productive. Since a CRM system’s database will have full contact information on every customer, running automated marketing campaigns is easy. These campaigns could be regular mail shots, or contact via email. 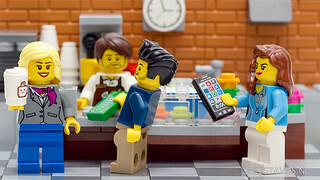 The system will select the customers who are most likely to have an interest in the product or service being marketed.